Getting there: Take the 1st exit after Sanford Lake coming from Midland/Bay City, turn left after the exit, and follow the signs to Pine Haven. What's there: Here's the thing. When you drive into the parking lot at Pine Haven Recreation Area, you're going to wonder what all the fuss is about. We don't blame you. Pine Haven's first impression is...well...a little under-whelming. But it's what's inside that counts. What's inside is miles and miles of wooded trails built on 325 acres of the most diverse terrain in Midland County. 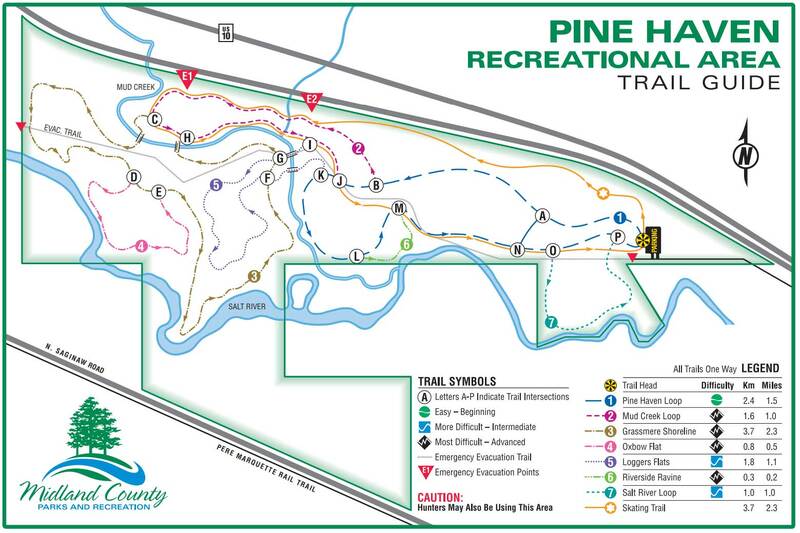 Pine Haven was originally built as a cross-country ski area and is posted throughout with signs indicating the degree of difficulty on each trail. So whether you are skiing, hiking or mountain biking, you'll always know the challenge that lies ahead. It may be hard to stop and smell the roses as you're careening down a steep hill on two wheels, but we think everyone should try. One of the Midland County Parks, Pine Haven is located in the woods along US10 near Sanford. Take the West River Road exit from US10 and follow the signs to the park. Trails (about 15K) are sometimes groomed (more reliably for classic).